Creative processes of different dance forms are extremely diverse. They emerge from their particular contexts and histories, structures, body and movement principles, training styles and methods, and individual inputs. This project explores the possible influence and worth of sharing specific creative techniques between two forms from different cultures and contexts. How can two western improvisation techniques – the Improvisation Technologies of William Forsythe and the Nine-Point System of Amanda Miller – be applied to the movement concepts of the classical Indian dance form of kathak. The term ‘Improvisation’ is common in both cultures, but its interpretation and use is markedly different. 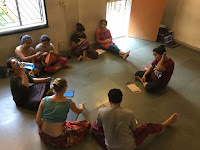 It is this area of multiple readings and perceptions that the workshop facilitators – Anika Bendel from Germany and Vikram Iyengar from India – are interested in. During a ten day residency the dancers from Ranan Performance Collective engage with different concepts and principles of body, space and movement. The process will culminate in an informal lecture performance on 30 September 2016, at the Goethe-Institut Max Mueller Bhavan, Kolkata, 6.30pm. All are welcome. 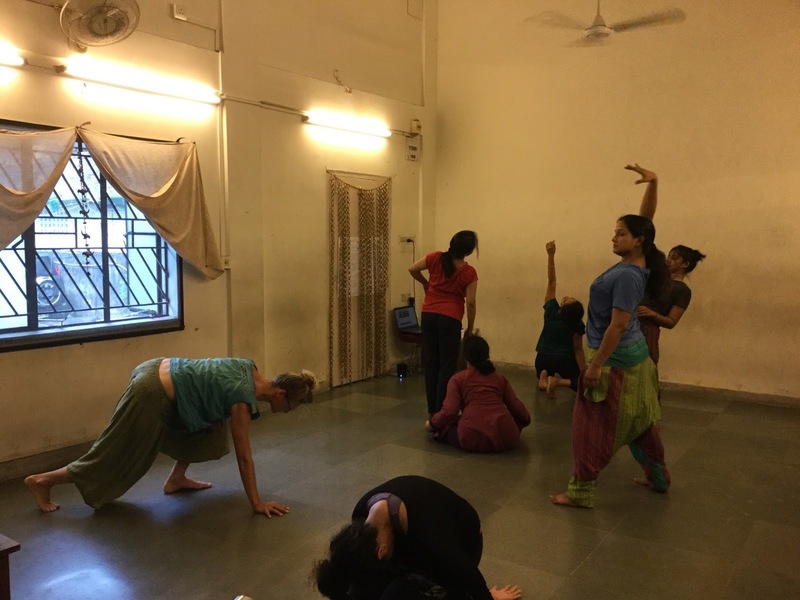 The residency is facilitated by Anika Bendel and Vikram Iyengar. The participants are Debashree Bhattacharya, Sohini Debnath, Samila Bhattacharya, Rhea Dawn and Indudipa Sinha of Ranan with guest participant Shoma Sharmin from Dhaka, Bangladesh. 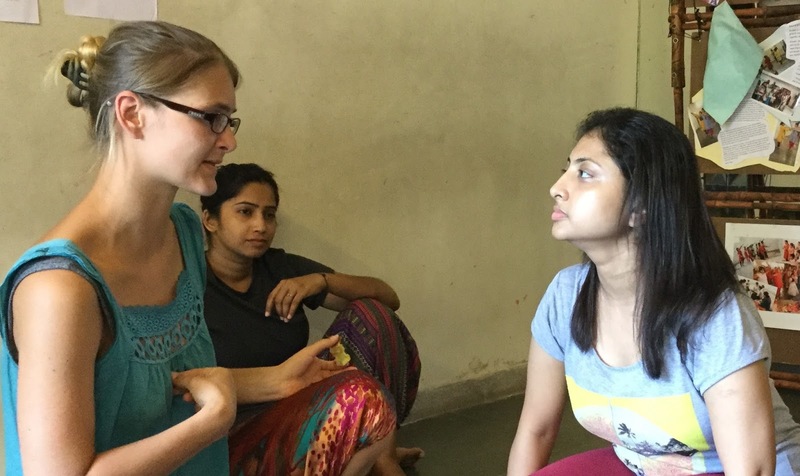 The residency is taking place at the Ranan Workspace and is supported by the Goethe Institut Max Mueller Bhavan, Kolkata. 15 September was the first day we met Anika. We were blessed to have Rani Aunty (RANI KARNAA) with us. 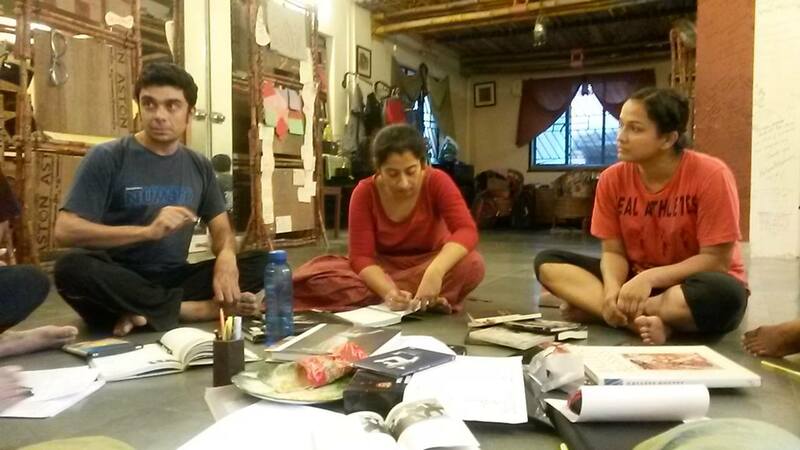 We had a long discussion regarding contemporary dance theory and history, research, issues, dancing skills, methods. 1st day of our workshop (16th September). As a performer I have too many questions in my mind... basically I got few of my answers through the process (which is not a regular process for me, but quite simple to take in). Usually I try to control my body, mind and spirit but I enjoy nothing. I wanted to be free. Through the process Anika was teaching my mind to listen to what my body needs to express through my mind. Now I know from where the sensation comes, and most importantly I have to trust my instincts carried by the surprise of its own unfolding. And it was a very good method of how to relax, breathe and let go through DANCE … JUST LIVE THE MOMENT. 2nd day (17 September): Better we should call it a Dance Education Day – which is not a daily practice of our country. We had several books in front of us. We were talking about new directions in Indian dance, the dance body and politics, dance improvisation and the mystery of improvisation. This was followed by video clips of traditional ballet, neoclassical ballet, contemporary dance, post modern dance and dance theatre. The last three days have been enriching experience. Variety of thoughts and impulses. It is like understanding any subject. One needs the first few days to get to the point and for a workshop of such nature this process is interesting as well as confusing specially during the initial sessions. On Monday we returned after a break with a receptive mind. It was a good experience to watch the videos at home and make notes. I was exposed to a world of contemporary dance which I was not aware of before. The history, the socio-political scenario behind it, etc. The discussion as usual was energetic and very informative. The discussion flowed from one to another and ultimately narrowed down to the idea of shape and form from the perspective of a dancer. The interesting point here was the existence of completely opposing ideas from a group of dancers practicing the same form for years. And the discussion was not really to deduce anything but to arrive at a certain plane of understanding, maybe. 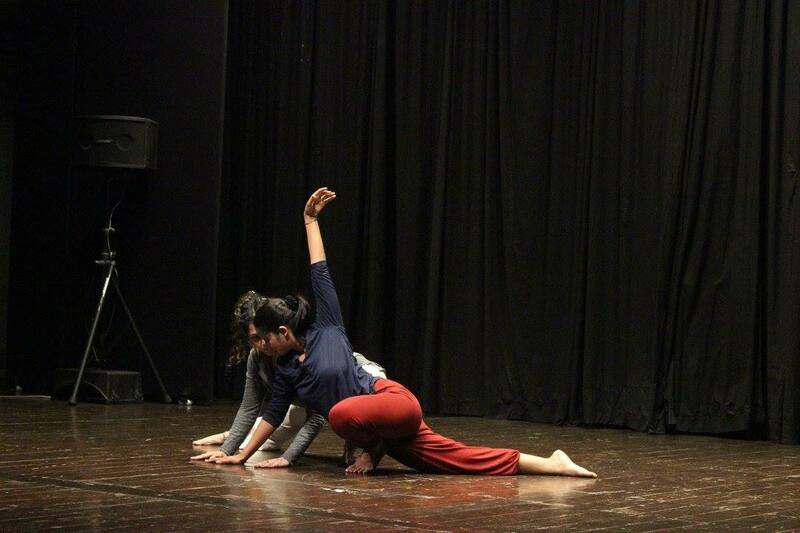 Finally Anika and Vikram introduced the concept of Improvisation Technologies by William Forsyth. There was a graphic video which gave us the basic points and understanding behind this method. and to make us aware why at all a choreographic experience can be considered as technology . For me technology meant application of a scientific knowledge. After watching the video and taking instruction from Anika I could vaguely understand the concept. Quite rightly put by Anika that initial experience would be very dry and technical. However we all tried our best in our own individual way to get to the crux and implement it. By the end of Tuesday afternoon we were introduced to the Nine Point system. For me this involved an entirely different thought process as Kathak dancer. There were lot of questions and queries that followed. It was a choreographic method that was challenging my understanding of what choreography is. The system gave fixed guided directions to the choreographer rather than allow her to imagine a design out of her instincts. Small individual endeavours continued and we are just at the beginning of the process. It is definitely difficult to shred off the form that you are so tuned to and so comfortable with and only concentrate on the concept that form believes in. I also felt that one needs to have very sound information of that particular dance form ; not only intellectually but also physically... to be able to disassociate the interlinked and interconnected thoughts and ideas. Yes!! We have completed the 7th day of the workshop and only 3 days left. I am enlightened by the whole experience. For me each day ended up with new understanding of dance in particular and art as a whole and we are still exploring. I achieved a new perception of 'why, how and what' is there behind the making of the designs and patterns through two methods of improvisation. (William Forsythe and Amanda Miller). Analytical discussions, conceptual contradictions, theoretical evaluations on different topics have enriched me and my ability to question and look for an answer. 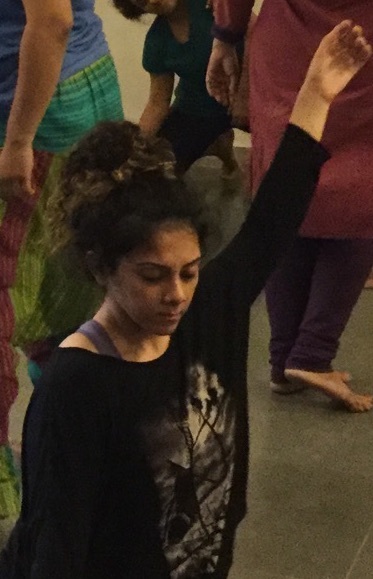 Having an experience of being with kathak for the last 18 years I gained further knowledge about the physical flexibility and how it helps to create a proper definition of the physicality of any particular movement. We worked on the concept of making a movement and the different methods of its application. I am certain that this is going to help me in my future endeavours. Our perception regarding directionality, extension, specificity of a movement, 3 dimensional postures got much better defined. At times I felt that our very known work space 'Ranan' was a UFO; am an alien in my own planet. 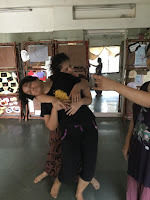 It was fun to apply them on a kathak bol and observe others. It seemed as if I was helplessly getting entangled with my madness in a weird relationship. The exploration continues, and is yet to take a final shape. I think we are gradually settling down with the idea of the 9 point system and its application to our way of thinking dance. It is a treat to be a part of this experience and I thank Anika and Vikram. 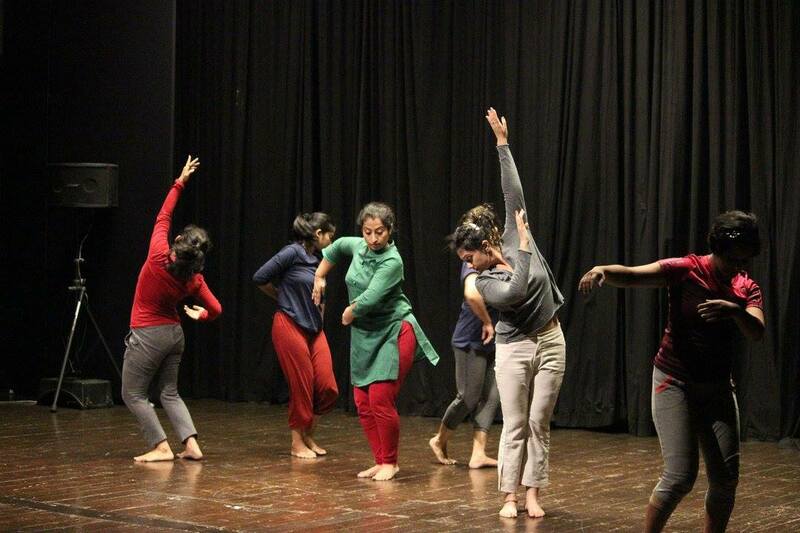 Here is toast to a kathak-less kathak-ness! 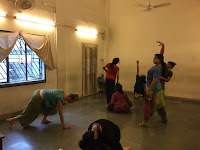 Books, dance education, history, evolution, discussions, brain storming sessions, contemporary dance, modern dance, video clippings, brilliant choreographers and performers, improvisational exercises, William Forsythe, Amanda Miller, 9-point system ................. all these and many more baffled my mind as I journeyed through the 10 day workshop conducted by Vikram Iyengar and Anika Bendel. 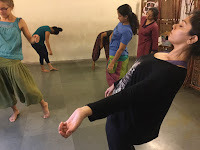 My kathak informed body was absorbing (like a sponge) everything while observing how one makes a movement and sculpts a space through different methods of application. The body of any dancer regardless of any form has its own presence and being! One needs to understand the body, the links between different movements and being conscious of the strength of its centre. (Re-visiting all these through a very different approach). ** What are the movements doing to the body that is doing the movement? ** A relationship to Space and a relationship to self ....... through pulling, pushing, extending, expanding, exaggerating. ** To think of the same thing (movement) with a completely new perspective. ** To be able to see sources of movements and inspiration in areas outside the boundaries of tradition and inherited thoughts. 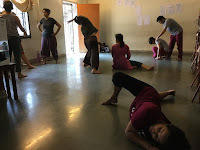 But for that one needs to look into our own dance technique and movement concepts and give more time to understand and practise the 9-point system so that one is able to develop one's own system to suit one's own concept of kathak. 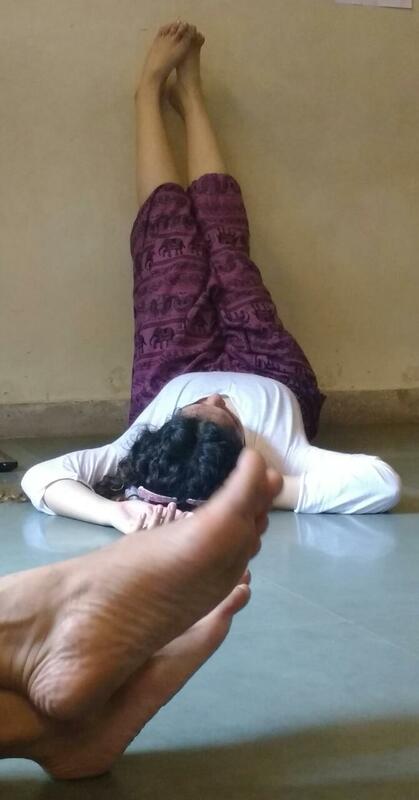 One can work with a form from a uniquely individual standpoint while overcoming the burden of being a classical dancer! This workshop has provided me the trigger points to look at improvisation and choreography from a different perspective!